So, you’ve designed your tables, chairs and windows. Are you going to just leave them naked? Nope. 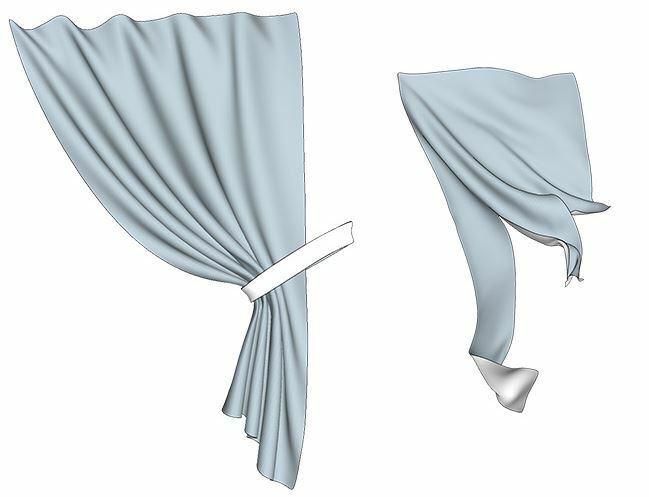 You’re going to use the fantastic ClothWorks extension for draping cloth and ropes over components of any shape and size and for simulating flags and curtains. ● Simple Grid and ​Smart Grid options for turning face or a set of faces within a component/group into a grid of faces, with a desired padding. An additional Purge Edges​ option can be used to remove the generated grid. These options are for manipulating cloth. ● Split Edges option for dividing an edge or a set of edges within a component/group into segments, with a desired padding. An additional Weld Edges​ option merges the split edges.These options are for manipulating wires. ● Loop Subdivision and ​Laplacian Smoothing​ options for subdividing and smoothing the resulting, simulated cloth (meanwhile preserving texture UVs). ● Drape and ​Undrape options for resetting and renewing cloth, rope, and pin orientations. This option is particularly useful for when changing cloth texture material. software, such as MakeAVI, can be used to combine a sequence of exported frame images into a video file. Check out a few different ClothWorks tutorials below and have fun dressing up your modelling! Need more ClothWorks in your life? Download it here. Need more tutorials on ClothWorks? Head over here.